In the end, AzhwAr says “paramapadham is easy to attain for those who learn this decad”. mAnagar – the great abode. AzhwAr who is having the divine name “SatakOpa” and the family name “mARan”, who is having attained emperumAn, the benefactor who has the divine chakra in his hand, by engaging in service through speech, is the leader of the distinguished AzhwArthirunagari and is having divine and very freshly fragrant magizha garland on his chest, out of great desire, mercifully spoke these 10 pAsurams among the thousand pAsurams in the form of a song. Those who can recite them, will have the great abode SrIvaikuNtam which is present in the other side, from where there is no return, in their hands’ reach, on top of the recital itself. Atcheydhu AzhippirAnaich chErndhavan – AzhwAr who attained emperumAn by serving him. He surrendered to sarvESvaran in the proper manner. That is, as said in SrI vishNu dharmam “vichithrA dhEhasampaththir ISwarAya nivEdhithum | pUrvamEva kruthA brahman hasthapAdhAdhisamyuthA ||” (Oh brAhmaNa! To offer oneself and other materials, AthmA previously got connected to the amazing body with hands and legs), instead of misusing the faculties bestowed by emperumAn, engaging them in the apt matter as said in thiruvAimozhi 2.3.4 “thandha nI koNdAkkinai” (You who created me, accepted me subsequently) and attaining him. The means for accepting the servitude is in emperumAn’s hands [the divine chakra]. As he [sudharSana chakkaraththAzhwAr] is engaged in servitude, he engaged AzhwAr also in servitude. As the divine chakra is united with emperumAn’s hands, AzhwAr too united with him. sErndha – Like a broken ship reaching the shore. Atcheygai means rendering service. Service can be of 3 types – mAnasa (by mind), vAchika (by speech) and kAyika (by body/actions). Among these, AzhwAr is not the one for mAnasa and kAyika kainkaryams. This is because, his nature is as explained in periya thiruvanthAdhi 34 “kAlAzhum nenjazhiyum kaNsuzhalum” (my feet does not remain stable, my heart is melting and my eyes are spinning). So, his service can only be through speech. [Here is a detailed analysis of the nature of the service done by AzhwAr in this decad/pAsuram] Does it say that AzhwAr served by singing thiruvAimozhi? No. If that is the case, this pAsuram should be in the last decad, that is in “muniyE nAnmuganE“; or it should have been part of the first pAsuram of thiruvAimozhi which is the essence of the whole prabandham; or, it should have been part of “pugazhu nal oruvan” decad (thiruvAimozhi 3.4), where AzhwAr performed kainkaryam by speech. Alright, shall we say that AzhwAr served by speech by mercifully explaining bhagavAn‘s supremacy after eliminating any doubts of supremacy for other dhEvathAs? No. That was already done in first pAsuram itself. Shall we say that AzhwAr is determining who is supreme and instructing the same to others? No. That was already done in thiruvAimozhi 2.2 “thiNNan vIdu” and thiruvAimozhi 2.8 “aNaivadhu aravaNai mEl“. Shall we say that this is explaining emperumAn‘s supremacy in archAvathAram? No. That was already done in thiruvAimozhi 3.6 “seyya thAmaraik kaNNan“. Shall we simply say that AzhwAr is instructing others? No. That was also already done in thiruvAimozhi 1.2 “vIdu min muRRavum” and many other places. So, what is the scope of this decad “onRum dhEvum“? On hearing AzhwAr mercifully saying “thirukkurugUr adhanuL paran thiRam anRip pallulagIr dheyvam maRRillai pEsuminE” (thiruvAimozhi 4.10.3), that is “polindhu ninRa pirAn” is the supreme lord, and seeing what is shown in “kabAla nan mOkkaththuk kaNdu koNmin” (thiruvAimozhi 4.10.4), everyone in this universe was reformed and became SrIvaishNavas; they became reformed to be performed mangaLASAsanam by AzhwAr. He dedicates a separate decad “poliga poliga” for such mangaLASAsanam. This samsAram which was unable to reform even by sarvESvara through his incarnations, was reformed by AzhwAr’s efforts. So AzhwAr is saying “Atcheydhu Azhip pirAnai chErndhvan” (having attained emperumAn through his servitude) since by his instructions he has reformed the entire universe so that he need not try to establish who is the supreme anymore [since everyone accepted his instructions and became SrIvaishNavas already] as said in thiruvAimozhi 5.2.4 “idam koL samayaththai ellAm eduththuk kaLaivana pOlE thadam kadal paLLip perumAn thannudaip pUdhangaLE” (To eliminate all the wrong philosophies, the devotees of the lord who is reclining in milk ocean, are spread everywhere). 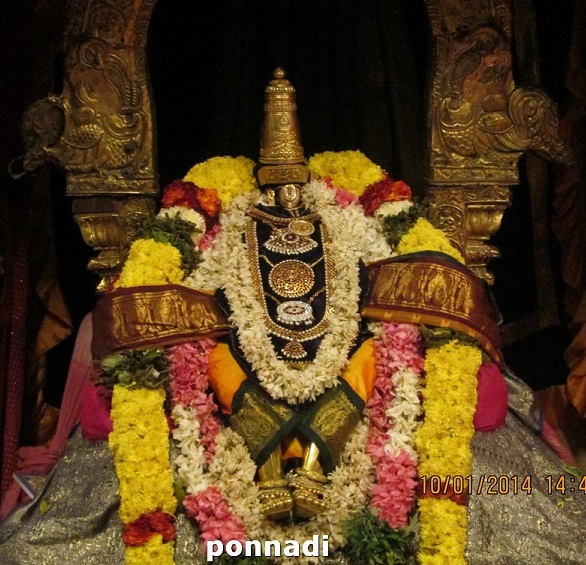 vaN kurugUr nagarAn – The cause for all these auspiciousness is the birth in this dhivyadhESam. nAL kamazh magizh mAlai mArbinan – In “naNNAdhAr muRuvalippa” decad, previously AzhwAr’s garland had become dry on seeing the sufferings of the samsAris (worldly people); now – on explaining the supremacy of bhagavAn, and becoming confident that there is no more sufferings for them, the garland became fresh. mARan satakOpan – He is the mruthyu (agent of death) for the hurdles in attaining bhagavAn. vEtkai … – He is not of the nature, where he is advising those who humbly approached him to learn these; it is out of his desire [and compassion], he is mercifully explaining this decad among the thousand pAsurams; for those who are well versed in this decad, the great abode of SrIvaikuNtam is within their hands reach and there is no return from there too. maRRadhu … – Both SrIvaikuNtam and leelA vibhUthi are at their disposal. maRRu is just an avyaya (no meaning, a word to just fulfil the poetic meter), the return-less paramapadham is within their hands. paramapadham is in their hands completely. Another explanation – the ultimate goal is knowledge about bhagavAn; the abode which matches such knowledge is also easy to attain for them. Another explanation – The great abode of SrIvaikuNtam is the other world, which is opposite to this samsAram. That is in their hands. This entry was posted in thiruvAimozhi, thiruvAimozhi 4th centum on May 8, 2017 by Sarathy Thothathri.